Brian Agnew has been training dogs for over 14 years now. He has always looked for ways to up his game when it came to working with dogs. He was introduced to Wendy through a friend and started using the Volhard Endurance supplement with his dogs as well as the training dogs. After seeing the amazing results, he finally made the move to feeding a Volhard raw diet. But he didn't stop there. As Brian and Wendy's friendship grew, Wendy became an invaluable mentor not only with nutrition, but training as well. With this knowledge, Brian has helped many dogs have a happy and healthy life. At The Dog’s Side we pride ourselves on being the best advocate we can for the pets in our care. I chose Volhard products many years ago after 2 years of battling stomach issues with one of our dogs. Her digestive system instantly changed and I was a believer. I have been distributing to my clients, family, and friends ever since. Volhard dog products have never had recalls or any other problems we see in the news with other companies. I am proud to be a part of the company and believe strongly in the products they create. Blair Diamond is a canine behavioral consultant for Primal Needs Behavioral Solutions working with the greater Sacramento area. He has had a lifelong devotion to understanding dogs and over the last 15 years, has gathered extensive experience working with dogs in various capacities: He attended the American College of Applied Science, where he received training in animal behavior analysis. He has trained with a number of Master Trainers throughout the United States to refine and perfect his unique, personalized approach to training. Blair has personally and professionally helped thousands of dogs and owners across the country overcome all types of behavioral challenges. John Knight began his professional dog training career in 2006. After training dogs in Beverly Hills for 6 year, he moved to San Diego where he now has his training business Sit Stay Come Dog Training. John specializes in training his clients to train their dogs with Balanced Training techniques. Before becoming a dog trainer, John was an author and motivational speaker traveling the world. He teaches three pillars to his clients – Training, Exercise, and Nutrition. Cheri Lucas founded Second Chance at Love Humane Society, a no-kill dog rescue, 25 years ago. She worked on Cesar Millan’s “The Dog Whisperer” for 9 seasons, and was the dog behaviorist on two seasons of Leader of the Pack and one season of Cesar’s Recruit Asia. Cheri co-developed the highly popular Training Cesar’s Way five years ago. Cheri teaches dog behavior workshops both domestically and internationally. She has a highly sought after mentor program, attracting students from around the world. Cheri specializes in using her balanced pack of dogs to help other dogs with socialization issues. She’s a gifted communicator who helps people recognize the role they play in their own dog’s behavior. Desiree is a dog professional located in Petaluma, CA. She has 15 years experience working with dogs and their people - currently she owns and operates Dog Days - a dog training/walking service. In her experience breeding Portuguese Water Dogs over the last 25 years, Julie has found that good nutrition is the keystone of raising healthy and happy dogs. When her first PWD, Quarry, began refusing to eat kibble, she conducted research on the topic and found Wendy Volhard’s book, Holistic Guide for the Healthy Dog. As she read the book, her entire philosophy regarding feeding dogs changed as she learned they require living food to thrive. Following the diet change to the Voldhard method, Quarry’s interest in eating immediately improved and remained strong the rest of his long life. Since Julie breeds PWDs using natural rearing methods, she also incorporated the Volhard feeding approach into the diet of her pregnant dogs and young puppies to ensure they are provided the most balanced nutrition available. As a result of using the Volhard diet, her dogs and puppies are healthy and happy and thrive. Alyson Rodges is a certified dog trainer specializing in puppies. A lifelong animal lover, Aly enjoys teaching people the necessary skills for them to better understand, communicate with, and enjoy a balanced life with their dogs. After training over 1700 dogs, and double that number of humans,she teaches life management skills through her Pillars of Pack Leadership® - five essential building blocks that are easily incorporated into everyday life for real people. APBC is located in Arroyo Grande, CA, where she lives with her family (the two and four-legged ones). Brian Bergford is a Dog Behavior Specialist, CDT, and the owner of Altitude Dog Training, Uptown Dog, and Bergford Performance Systems. He earned his degree in Psychology from the University of Colorado, taking particular interest in neuroscience, psychopathology, clinical psychology, nutrition, and the principles of peak human performance. Brian specializes in dog training and behavior rehabilitation. He is also an author, speaker, and coaches enterprising and high-performing individuals, helping them create breakthroughs and peak performance by maximizing their psychology. In 1972, Crista began training and showing dogs competitively. This required the dogs be in the very best health possible. She has since owned many pet care businesses in both Colorado and Texas. Crista found Wendy Volhard, began studying under her and using Volhard recipes and supplements, in 2002 while living in Angola, Africa with 7 animals. Through her teachings, she was able to keep her animals healthy in a very unhealthy environment. She has been honored to attend 14 of her annual Healthy Dog Conferences and became a Volhard customer consultant at her request. Crista's passion is assisting clients in improving their pet’s health. Nutrition is the starting foundational building block to achieve this. Her clients are located around the world and referred to her via many avenues. Many of them are referred to her by holistic veterinarians who want another set of eyes to assist in sorting problems. Tom Morais is a former Executive Chef who always enjoyed training dogs. After 20 years of helping family and friends with their pets, Tom finally made the leap into training dogs professionally in 2013. Since then, he has trained hundreds of dogs in California and Colorado, helping people enjoy their pets and include them in day-to-day happenings much more often. Tom lives with his partner, Marilyn in Boulder County and together, they run Lucky Jack Dog Training and Wicked Lucky Dog Rescue. John T. Rohrig IV is a Human and Canine Wellness Specialist as well as the owner of Bark for Help, Inc He earned a degree in Behavioral Science, realizing that many components of canine psychology can also be applied to human psychology. He uses unique and holistic approaches to educate and guide people as well as their companions to achieve more balanced, stress-free lives. He possesses a natural ability to help his clients (humans and dogs) conquer fear and anxiety, build self-confidence, and create/maintain strong, healthy habits. With a passion for overall wellness, John constantly expands his knowledge to improve both canine and human health and nutrition using his vast network of working professionals. He believes all problems have solutions, usually simple but not always easy. Lori has had the honor and privilege to help people find harmony in their life and homes with their dogs through dog training for over 18 years. What started as a desire to find the answers to the problems she was having with her own dogs has led her on the most amazing journey. Over the years, Lori has expanded her knowledge to encompass improving dog health and nutrition. Together we can bring out the best in your dog! Christie Mault, owner of The Canine Professor, started her career helping dogs (and humans) in 2001. She is a nationally certified dog behavior specialist with a passion for helping dogs that struggle with fear and/or anxiety. Christie believes "training" is much more than teaching a bunch of commands. Her philosophy starts with nutritional awareness because if the dog is not optimizing their nutrition it is much harder for them to learn how to cope with stressors in this human world. Christie is passionate about her work and continues her education, taking classes, attending seminars and conferences to learn new ways of facilitating dog-human communication. Blake Pilgreen is a nationally certified dog trainer who has an extensive history working in animal hospitals both as a veterinary technician and also a kennel technician. Blake understands the importance nutrition plays in a dog's life and understands how the combination of training, exercise, nutrition and affection helps our dogs live their best lives possible! After using several respected commercial food brands and having problems with his own dog's (Swell) health (skin, allergies, bad breath etc.) he discovered VDN products and began using them on Swell, a 3 year old yellow labrador retriever, and began seeing significant improvements in his overall health and well being. Blake can not wait to help educate his clients on VDN products so that they can see those same results for their own pets! Lauren Turner is the owner and trainer at Ideal Dog, a holistic dog training business in the panhandle of Florida. She is a graduate of the US Air Force Academy in Colorado Springs, Colorado and a veteran of the US Air Force. (She jokes that she left the Air Force because they wouldn't let her switch careers and become a dog handler.) She opened Ideal Dog because she realized she had the passion and skills necessary to really connect with both people and dogs and transform their relationship from one of stress and friction to true companionship. She sets herself apart by not only training the dog behaviorally, but rehabilitating them through the use of proper nutrition, diet, and physical health and coaching their owners on how to be a stable and calm leader in the relationship. She is a wife to an Air Force pilot and mother of a red-headed, spitfire son, and is thankful every day for their support. Barbara has had the privilege to share her life and home with three rough collies and three German Shepherds who have crossed Rainbow Bridge. Currently, she and her husband have two German Shepherds who are family, one who is training to be her Hearing Alert Dog. Professionally, Barbara began life as a high school English teacher. But from the time her mother started obedience training with the first shepherd, she has been fascinated not only with the world of dog training, but the human-dog relationship. She competed in obedience trials for about five years until graduate school, along with a fulltime job, made that impossible. Barbara has been active in Pet Therapy, both as a team member and an evaluator, since 2000. So when teaching school no longer appealed, dog training was the obvious career choice. She completed the National K-9's Master Trainer Certification in 2007, the IACP CDT, and continually attends workshops, etc. In 2007, Barbara opened K-9 SOL (Socialization, Obedience & Leadership) as a Pet Training and now has moved into Service Dog Training so the name has segued into K-9 SOL (Saving One's Life). No matter what other training, Barbara believes owners need to understand about quality nutrition for their dogs. Currently, she offers Puppy PreSchool, Basic Obedience, Behavior Modification with TBTE, and Service Dog training in either Medical Alert and Mobility. Robin is a professional dog trainer with over 25 years of experience. Prior to the training profession she worked numerous years as a veterinary technician. Her background in animal healthcare, along with a B.S in Biology, combine well to serve pet owners seeking healthy, innovative and practical solutions for their dog’s well-being. Robin believes that optimal nutrition is a necessary foundation for great dog. The addition of exercise, training, play and affection then create a long and joy filled human-canine relationship! Ann Greene is a sought after Certified Professional Dog Trainer, Aroma Therapist, Herbalist and Canine Nutrition Consultant, who works tirelessly, helping dogs live their best (LONG) life. The link to longevity and diet, and to behavior and diet is undeniable. Ann's journey to canine nutrition began in 2012 when her own two dogs became very ill after eating a (well respected, expensive) commercial dog food. Ann began studying with Wendy Volhard at her annual Healthy Dog Conference 4 months later, and the learning has not stopped. Ann has helped countless dogs. Let yours be one of them. Rick is a Certified Professional Dog Trainer; graduate of the prestigious National K9 School for Dog Trainers in Columbus, Ohio and on the Board of Directors of the International Association of Canine Professionals (IACP). After his retirement as a Special Agent with the U.S. Secret Service, Rick rescued a Belgian Malinois, Bella, and that is where his dog nutritional journey began. In 2012, Bella became violently ill as a result of recalled “high-end” kibble during a cross country RV trip to train with Cesar Millan, The Dog Whisperer and began his long-term relationship with Wendy Volhard and Volhard Dog Nutrition products. At one point, Bella’s liver enzyme levels were severely (five times the upper limit) above the reference range and her condition was quickly reversed with diet and herbal supplements alone. After that, he was sold and it became quite clear to Rick that “you are what you eat” and a healthy diet for a dog was the key to increased longevity, reduced behavioral issues, and the overall wellness in both body and mind, resulting in a happy dog and a beautiful relationship. Living with her boxers and staffordshire terrier, Gail is located in the Finger Lakes of upstate New York. Gail is a certified professional dog trainer and through her business K9Healers (www.k-9healers.com) Gail teaches group classes and offers private lessons and specializes in Animal Assisted Interventions. Dana Brigman, of the K9 Coach Carolinas, specializes in Dog Training Behavior and Animal Wellness. 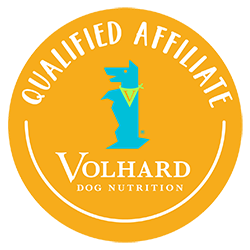 She is proud to be an affiliate with Volhard Dog Nutrition and coaches her clients on these amazing products and nutritional changes that may lead to improved health and wellness, or even longevity of their pet. Dana is also certified through the Veterinary Medical Aromatherapy Association and a non-veterinarian member. Essential Oils and Natural Wellness products are a core component of work as a behavioral expert and wellness coach. Dana is also certified in Animal Raindrop Technique. This service offers Emotional Release, System Detox, Immunity Boost, Inflammation Relief, Performance Recovery, Joint Care, Stress, Wellness Support. She is a Reiki Master, specializing in animal energy work and healing, and offers a unique program for the human and dog pair. Reiki energy flows through and around you. Reiki treats the whole animal (or person) including body, emotions, mind and spirit, creating many beneficial effects that include relaxation and feelings of peace, trust, confidence, health and well being. Many have reported miraculous results. Dana is also a practitioner with Healing Touch For Animals®. She offers a complete wellness review on ongoing support with all clients and is happy to chat with any interested in learning more. Jayme has been training dogs professionally since 2012. Her passion for helping educate dog owners on dog behavior and helping dogs live happy lives with their families has been an incredibly rewarding adventure. Jayme sees tremendous value in understanding how the role of health plays into achieving those goals and has had her own journey, both with her own dogs and clients, in finding the true value in starting with a healthy diet. Jayme’s dogs have been eating Volhard Dog Nutrition since 2016 and she (and they) couldn’t be happier about it. Jenny Lang has been immersed in dog care since the young age of 14. She worked in Emergency Veterinary Medicine Field for 15 years. Jenny had a daughter in 2012 and decided to start watching friends and families dogs in her home. Soon after, she taught herself how to groom with the help of You Tube. After dealing with a great deal of difficult dogs and under socialized dogs her desire to pursue a career in dog training blossomed. Jenny began traveling the country to study under some of the top trainers in the US. In 2018 Jenny built her first facility in Frisco, Texas - Lakeside Paws. Here they offer professional dog training, day care, boarding and grooming. Jenny is passionate about educating clients as to the importance of dog nutrition. Patricia Boden is the owner of Animal Connection, an all natural store for pets, in Charlottesville, VA. Pattie attended Wendy Volhard’s Holistic Dog Conference in 2003 when she opened her store. She trains her retail sales staff and groomers to be proficient in kinesiology, nutrition, homeopathic remedies, and herbs so they can make knowledgeable recommendations to both canine and feline customers. With six raw food freezers in a 3,000 sq.ft. store, the addition of the Volhard food and supplement products will further support the fine holistic nutritional line up our store is known for by the central Virginia pet community. Sarah, a professional dog trainer since 1996, specializes in solving behavioral problems. Her interest in nutrition was sparked by her own dog who started exhibiting dull coat, itchiness, general malaise and attitude problems which mirrored many of her training clients. After much research Sarah discovered that a lack of appropriate nutrition was at the root of many behavioral issues; once proper nutrition was achieved any leftover training issues were much easier to eliminate. Now, the first thing she asks is, “What’s your dog eating?”. Sarah continues to avidly expand her knowledge in nutrition through books, webinars and conferences. Jane owns Mountain Run Kennel in Culpeper, Virginia. She started the kennel in 1980 as a facility for training field trial dogs. Her main accomplishment was to make two Dual Champions (Field Trial/Bench). Over the years, Mountain Run Kennel has become a top boarding facility catering in large part to clients in the Washington DC area. Jane began breeding dogs in my twenties and has now bred a litter of Labrador Retrievers almost every year for the last forty years or so. Her feeling is that, above all, puppies should make outstanding pets, smart and healthy and eager to please. Renée Lamoureux owns Follow Me Dog Training LLC in the Richmond, Virginia area. She has been feeding NDF2 to her dogs for many years and has attended the Healthy Dog conference twice. Theresa is a longtime trainer and friend of dogs (as well as their owners). Having started off in upstate New York, she now serves the Culpeper, Virginia area from a dog oasis she has dubbed “Mahogany Ridge.” Central to her work is the view that we must “look at the whole dog,” which requires a holistic balance of our dog’s nutrition and training. Her annual Volhard Camp allows trainers to harness the Volhard Motivational Method, equipping them with the skills and knowledge necessary for success in multiple arenas. Katelin is a balanced dog trainer and lover of all animals and the outdoors. She started out volunteering at her local animal shelter and her passion grew to become a trainer. She hoped to keep dogs out of shelters with simple behavior issues and help ones in the shelter get a loving home. She's currently the president of WCASS Inc, a nonprofit organization to help these shelter pets. Also, Katelin takes one shelter dog at a time to train and foster them until adopted. She has a passion to help people with their pets whether they are aggressive or just need some simple improvements. Seeking answers to her personal dog’s skin issues, her interest in dog nutrition was ignited and led to attending the healthy dog conference where her eyes were opened to so much more information. Katelin is excited to help others and continue her education along the way. Sandy owns Red Barn Ranch and Labradors, LLC, nestled in the Shenandoah Valley, in Charles Town, WV. She raises AKC registered Labrador Retrievers and is a certified dog trainer, working with all dog breeds. Sandy was introduced to Volhard Dog Nutrition in September of 2009, attending Wendy Volhard's Healthy Dog Conference. The impact of that conference led her to a holistic approach to raising her Labrador Retrievers and lit in her a passion for improved health and nutrition for her dogs and her clients' dogs as well. Sandy offers workshops and private instruction in making Wendy's "original recipe" from scratch.